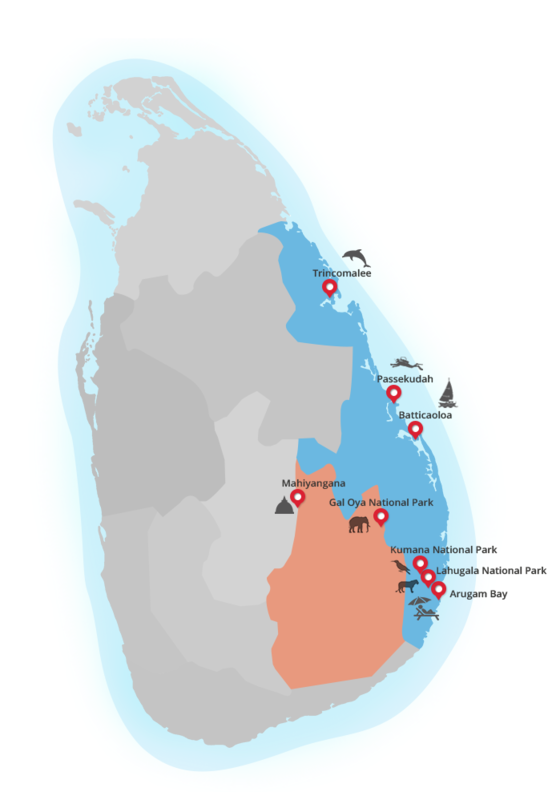 The Kumana National Park lies north of the Kumbukkan Oya and borders the Yala National Park and is referred to as Yala-East. Kumana comprises of scrub jungle, brackish lagoons, rocky outcrops and numerous waterholes and is regarded as one of the best national parks for birders where a variety of water birds, dry-zone resident species, and waders including rare winter migrants can be seen. Kumana Villu in the centre of the national park is a rookery were thousands of water birds such as Cormorants, Painted Storks and Open-billed Storks nest. Small herds of Asian Elephant can be seen, while occasional sightings of Leopard and Sloth Bear are also possible particularly in the dry season from around June through to September. Mugger Crocodiles can be seen in good numbers while the larger and more endangered Estuarine Crocodile is also seen here. Kumana is also a part of the Pada Yatra pilgrimage route in the lead-up to the Kataragama festival which takes place in either July or August each year. Within the jungle adjacent to the Kubkukkan Oya is a sacred Hindu Temple which is visited year-round by both Buddhist and Hindu devotees. There are also a number of interesting archaeological sites in the outskirts and within the national park itself. One of the most impressive is the rock caves at Bambaragassthalawa which has some inscriptions and a 36 feet high Buddhist statue dating back to the 9th century AD. The remains of a rock temple from the 3rd century BC at Bowattegala are also worth exploring.